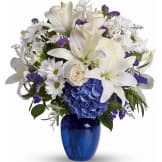 The Written in the Stars Bouquet is a stunning and elegant way to show how much you care. 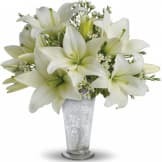 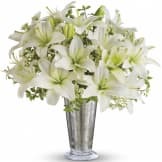 • This vase arrangement includes flowers such as elegant white lilies and pretty white waxflower stems arranged in a silver Mercury Glass Antique vase that brings to mind a star-filled sky. 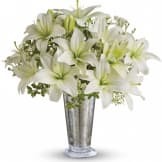 • Standard arrangement measures approximately 12 1/2" W X 14" H.
• Deluxe arrangement measures approximately 13" W X 16" H.
• Premium arrangement measures approximately 14" W X 17" H.
Flowers will be received by a Serenity Funeral Service's staff. All of our flowers are designed and delivered by hand from a local florist in in Wetaskiwin.